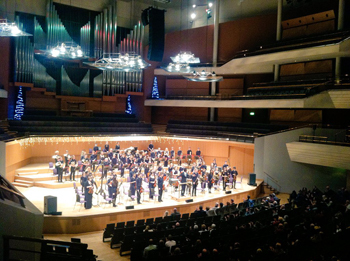 The Halle Youth Orchestra is a concert orchestra of nearly 70 young musicians all aged between 13 and 19, and all come from within the boundary of Greater Manchester. There is some serious talent here, and I sincerely hope that all of these young students find work with their chosen instrument, maybe even with the Halle Orchestra itself - who knows. Maybe it was the timing of the concert, but sadly, the auditorium was fairly empty. It seems that punters are willing to pay for Christmas entertainment at this time of year, but the more classical and traditional fayre has been forsaken. That is such a shame since these musicians need and deserve all the support and encouragement they can get. Why not move the date of this concert either forward or back by just one month; maybe that would have an impact on ticket sales? In tonight's concert there were three pieces on the programme. First, a piece written just for the strings, and for some reason - I have no idea why - the conductor chose to ask the violinists to stand for this. It did look rather odd. The music was by Edvard Grieg, and it was his well known and much loved Holberg Suite. Following this, it was the turn of the woodwind and brass instruments to shine, as they were given a piece which showcased them alone; Stravinsky's Symphonies For Wind Instruments. Stravinsky uses the word symphony here in its original meaning of 'sounding together'. It is a very difficult piece to both play and listen to; deliberately discordant and changing both key and time signatures as it progresses, there is little to latch on to, and yet it is nonetheless captivating. The whole concert was under the direction of the enigmatic and passionate baton-waving of Jonathan Heyward, and I am looking forward to seeing a lot more from this exacting and precise new-conductor-on-the-block! He was certainly more than capable of bringing out the absolute best from his young charges this evening, and both him and the orchestra were a sheer delight.